It's officially getting crazy around here. School is back in session, my current client project is in full swing and of course there's the day job. I thought I'd pop in and share my latest project with you guys. It's a young family that reach out to me about a year ago, looking to spruce up their main living space. The home is fairly new but could use a healthy dose of their personal style to make it feel more like home. After meeting with the client, I got to work on a design plan for the space. We decided to go with a traditional scheme with rich red and navy accents. 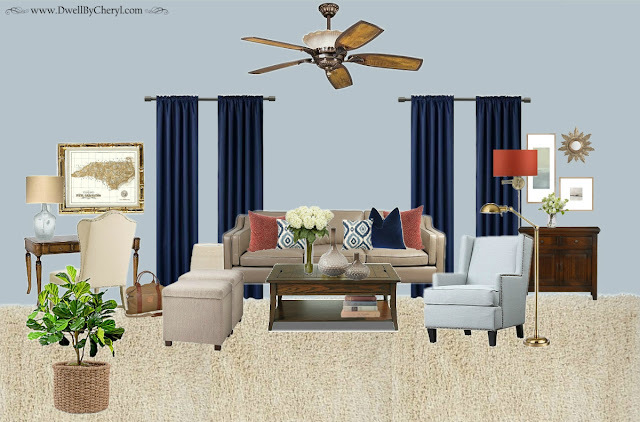 The client fell in love with the idea of serene blue walls and we're currently trying out a few options. She also has her heart set on replacing here existing recliner with a new more streamlined one. That's a tall order, but I think I may be up for the challenge. Needless to say, we've strayed a bit from the original plan, opting to eliminate the area rug and invest more in furniture pieces. 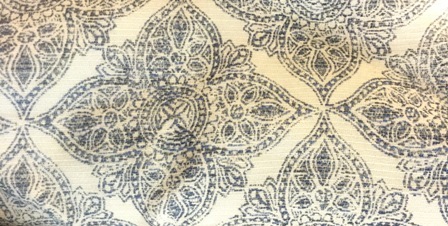 I've also found an awesome cream and navy print fabric that we'll be using to make pinched pleated drapery for the space. I think it will add a little more interest than the navy ones pictured on the plan. Plus, who can resist a pinched pleat? It won't be long now and that makes me very excited! I'm also all set to work on a One Day Design project this weekend. This client just needs some help pulling things together. She's got loads of style but seems to be a bit stuck with her current pieces and the overwhelming amount of options out there. Dwell by Cheryl to the rescue!!!! Tune in on social media this weekend, as I'm sure I'll be sharing the process throughout the day.